Your English classes will love Rainbow Rainbow. When your children have learnt it, they can perform the action song at school concerts and events. The song teaches key language about weather and the colours of the rainbow associated with different fruits. The e-book will help you recycle and practice the themes and language presented in the action song. A complete teaching actions video of Rainbow Rainbow. Quickly learn the action song before teaching it to your classes. Two MP3 files of Rainbow Rainbow: the guide-voice version (sung by jazz singer Melissa Stott) and the music-only, karaoke version for school performances. A set of illustrated worksheets and classroom activities to recycle the contents of the song in a variety of contexts. You can photocopy and print them or project them on an electronic whiteboard. Teacher’s Notes and Lesson Plans: suggestions on how to use the FunSongs Method and adapt the activities. 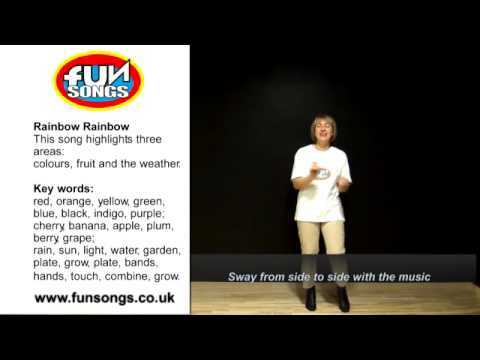 As well as colour and food, the song introduces weather vocabulary. Teachers often teach Rainbow Rainbow as part of a cross-curricular CLIL project. Nouns: days, sun, light, water, colour, bands, hands, cherry, fruit, orange, lunch, banana, snack, garden, apple, plate, plum, cake, berry, taste, grape, vine, color, colors, colour, colours. Verbs: to be, to grow, to shine, to rain, to combine, to make, to reach out, to touch, to come, to go, to put, to wait, to bake, to hang. Present and practise words related to the the colours of the rainbow. Present and teach common fruits. Introduce the theme of growth in nature and the importance of water. Provide an action song which can be performed at school concerts and events.